Combine the butter, sugar and 1 cup (250ml) water in a saucepan. Bring to the boil over high heat. Remove from heat. Add flour and stir to combine. Place over high heat and cook, stirring constantly, for 1-2 mins or until dough is smooth and leaves the sides of the pan. Set aside for 10 mins to cool. To make the chocolate sauce, combine the chocolate and cream in a small saucepan over medium-low heat. Cook, stirring, until chocolate melts and mixture is smooth.Keep aside. Combine the extra sugar and cinnamon on a large tray. Transfer the dough to a bowl. Whisk well until smooth. Add the eggs, 1 at a time, beating well after each addition, until mixture is smooth and glossy. Transfer to a piping bag fitted with a 2cm fluted nozzle. When oil is medium hot pipe the dough into the oil, cutting the dough with kitchen scissors. Cook until golden brown. Use a slotted spoon to transfer to a plate lined with paper towel. Add to the cinnamon sugar and toss to coat. Repeat with remaining dough. 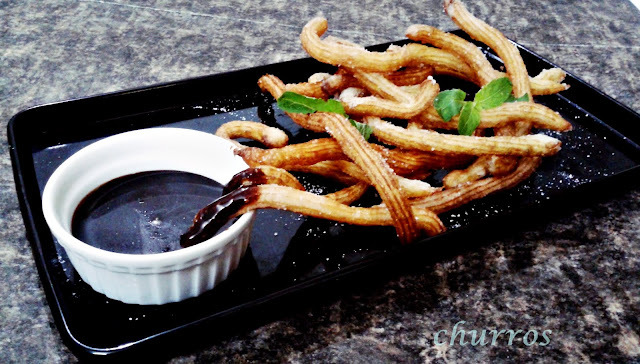 Serve churros warm with the chocolate sauce for dipping.